While on my trip to PASS Summit 2014, I have selected one more book to read on the long flights and this time it was Essentialism: Essentialism: The Disciplined Pursuit of Less, written by Greg McKeown. The word disciplined is essential for those who want to get better focus on anything. The number of distractions is so big that at any given time one risks to loose the current focus, and since to err is human, one needs to get back to the focus times again, working & creating an internal discipline. My personal fascination with the subject is connected to the most inspiring phrase in my life, which was written by the famous author of the Little Prince, Antoine de Saint-Exupery, who wrote that “Perfection is Achieved Not When There Is Nothing More to Add, But When There Is Nothing Left to Take Away“. 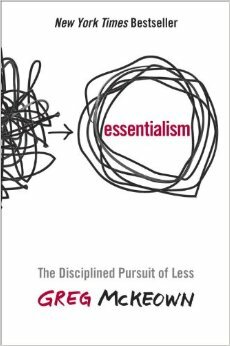 Author of this book is arguing that Essentialist is not about getting more in less time (optimisation), but it is about getting done the things that are right, that are essential. This book is not about productivity or time management, it is a waking call to tell you that you should concentrate on what really matters for you, the “things” that you enjoy & love. Being more focused on the essential allows one to feel less stressed and definitely more happy – I totally agree with this, but I know that I need to apply this strategy with more focus in my life. I confess that I particularly enjoyed the mentions of the Kairos as a kind of an opposite of Chronos, being the moment of now, the crucial time for something. There are a lot of books written on the subject, one of the most prominent in the recent years being Getting Things Done by David Allen. We are all surrounded by the similar thoughts and considerations, but the path to the same objective might vary from a few words to being a completely different approach. The book is highly recommended, if you feel like you should consider improving your focus. And quite honestly we all should.